Nothing empowers a consumer like having choices, because one size definitely doesn’t fit everyone. That’s why Armstrong Plumbing, Air & Electric has revolutionized our Armstrong Service Agreement Plan (ASAP). Now you have the choice of five different plans to fit your needs and your budget. When you move up to Prime Protection those system inspections become tune-ups by our highly-trained Armstrong technicians. The regular maintenance satisfies manufacturer warranty requirements. Armstrong’s Signature Protection plan is very similar to what many of our customers have had for years. It includes everything in Prime Protection and adds additional benefits. The big addition to the Prestige Plan is that it includes a yearly plumbing inspection to spot plumbing disasters before they happen. It also expands many of the benefits you receive in the Signature Plan. So, now ASAP stands for choices. You get to choose how much protection and peace of mind you need and can afford. 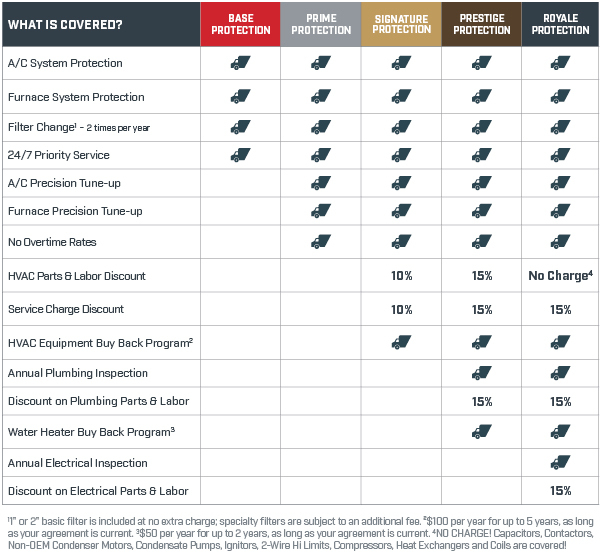 Of course, we all know what else ASAP stands for: As Soon As Possible – which is when you should be calling Armstrong Plumbing, Air & Electric to learn more about our revolutionary new service plan choices.